I don't have dogs anymore, both of mine died several years ago, they were old and sick and I miss them very much. 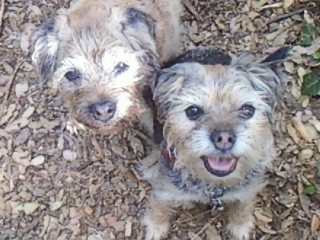 Two border terriers are amazing fun and a house is quiet (and easier to clean) without them. Though dropped biscuits have to be picked up now, when you have dogs dropped biscuits mysteriously vanish. Both of my dogs were microchipped and I have always been a firm believer that identifying your dog in that way is a sensible precaution, useful if they run off, are stolen and later abandoned, or to confirm ownership. If your dog is not chipped you should read this! "Most dog owners are unprepared for new legislation which makes it compulsory to microchip their pets from April 2016. Online retailer MedicAnimal has taken a straw poll of animal rescues and believes that over 3.5 million dogs still have to be microchipped before the deadline – or around 360,000 each month. A further 2.7 million dog owners could be prosecuted for failing to keep their contact details up to date. The new law comes into place from 6th April 2016 in England and spring 2016 in Scotland and Wales, requiring that dogs are chipped and owners keep their contact details up to date. The animal shelters and rescues that MedicAnimal spoke to claimed that about half of the animals that could be identified by their chip could not be quickly reunited with their owners as so many had not taken this simple step to ensure they could be contacted. He continued, “Not knowing what has happened to your missing pet is a dreadful situation for any pet owner and we are reminding everyone to not just chip their pets but to keep their contact details up to date too. There are clearly millions of people set to break the law by spring next year and our plea to them is to please think about acting now to give vets and implanters time to chip and register their pets.” "
Find out more about microchipping here - or contact your vet.